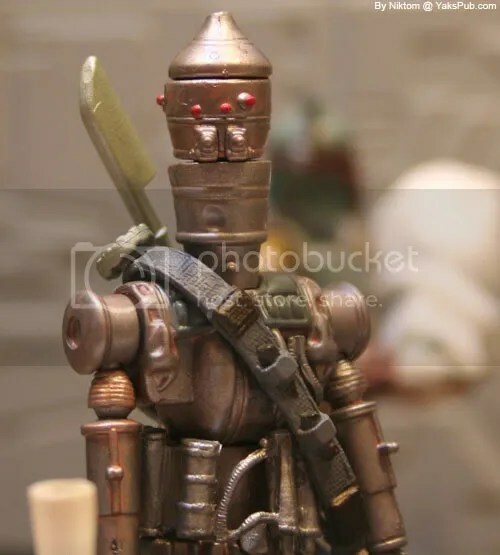 I don’t get this one or wait,I get IG-88 is thinking of an outdated driod.P.S.Where do you get all these figures? If you look in the backround,you’ll see Boba giving a gift to Bossk. 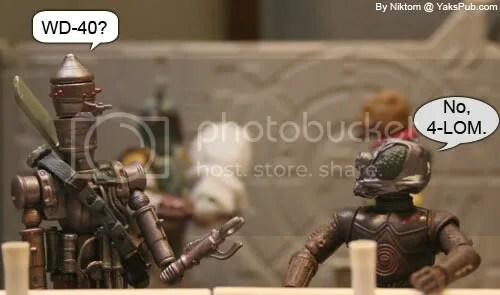 what is boba giving bossk? Fett dude – either you’re not from the US or you’re not very familiar with the world…WD-40 is a spray lubricant used to loosen rusty nuts & bolts. The joke is that it also sounds like your typical SW droid designation. Look anonymous,I’M FAMILIAR WITH THE WORLD AND I DO LIVE IN THE U.S. I’M TEN YEARS OLD,I DON’T KNOW ABOUT IT OTHER THAN WHAT YOU JUST SAID!OK TEN Ughhhhh!OHH YEAH I’M FAMILIAR WITH THE WORLD I JUST DON’T KNOW WHAT THE SPRAY WAS.NO Offense,you should try not to make me mad again because that made me MAD,AND I MEAN MAD!!!!! Guys, he’s really mad. He used caps lock. Thanks again, Trooper_1138 for showing my point.I really appriciate that you understood my mood about that I just thought it was kind of unpolite about anonymous’s comment I mean look,when I say I’m mad,I mean mad! Oh then thats alright,I just thought it was unpolite to type in I’m not familiar with the world or I don’t live in the U.S.A.Apology accepted,Anonymous,I’m just to easy to fool,And also I think these guys felt bad for me,I just don’t know online. Dude, I’m sorry…. ha ha ha ha… jk. this would’ve been a good strip if it was only the first panel, but what really makes this great is the 2nd deadpan look into the camera. what emotion out of IG! Garbage disposal… you just gave me an idea. Good to see you back, missed ya man.